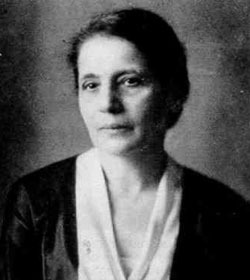 Lise Meitner was an Austrian-Swedish physicist who worked with Otto Hahn to discover protactinium. Following their experiments bombarding uranium with neutrons, Meitner collaborated with her nephew, Otto Robert Frisch (1904–1979), to discover nuclear fission and predict the chain reaction, although she refused to work on development of the atomic bomb. She also discovered Auger electrons (see Auger effect) independently of Pierre Auger. In 1935, she found evidence of four other radioactive elements corresponding to atomic numbers 93–96. In 1938, she left Nazi Germany, and took up a post in Sweden at the University of Stockholm. Element 109, Meitnerium, is named in her honor.